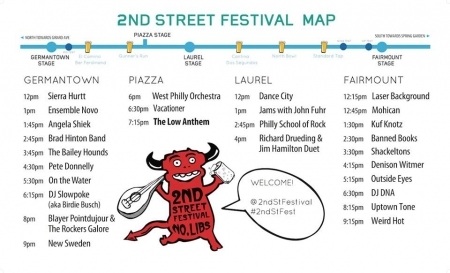 Philadelphia, PA (Northern Liberties) The founders of the 2nd Street Festival today announced the final programming and vendor lineup, sealing the deal on their promise to light up Northern Liberties with a musical bash and multi-block party on Sunday, August 4th. The event is a FREE, all-day celebration of the community and culture on 2nd Street and will present a total of 27 artists on four stages, at Georgetown, Laurel, and Fairmount Streets, as well as in the Piazza. The 2013 installment marks the third year of unique partnership with the Philadelphia Folksong Society (PFS), as well as Point Entertainment and Electric factory in programming the 7-block party. Headliner The Low Anthem returns to Philly for the first time since hiatus, promising another unforgettable headliner performance, which in previous years included the likes of indie goddess tUNeYaRdS and Philly fringe folk heroes Man Man. The Low Anthem and others on the Piazza stage will be broadcast by partners at iRadioPhilly on their website and mobile apps. To check out the details of the broadcast visit the 2nd Street Fest broadcast page. This green-light approach to bringing culture to every cranny of 2nd St. is the brainchild of founders William Reed (Standard Tap and Johnny Brenda’s), Owen Kamihira (Bar Ferdinand and El Camino Real) and Oron Daskal (North Bowl). Their restaurants turn into street taverns, with beer gardens and food specials, along with dunk tanks, moon bounces, and craft demos all within arm’s reach. Daskal’s North Bowl transforms into a day-long party (and after-party) mecca with guests like Rich Medina, Willyum, and Rob Paine. In addition to music and hospitality, the 2nd Street Festival will offer over 100 crafters and vendors, kids programs, workshops, and eco-friendly initiatives. The 2nd Street Festival is still accepting volunteers as well as craft, food, merchandise, and nonprofit vendors as part of its celebration.